I’m finally well and truly on holidays! As I see my friends all jetting off overseas on their holidays, all I can do is live vicariously through their snaps. Seeing all their posts made me inspired to look into overseas holiday venues and see what they all had to offer. I’ve always been amazed by Las Vegas and seeing as I’ve always wanted to go there, I decided to research Vegas through VEGAS.COM (an AMAZING website btw, it has everything you’ll ever need to know about Vegas from hotels to show, attractions, tours and more!). 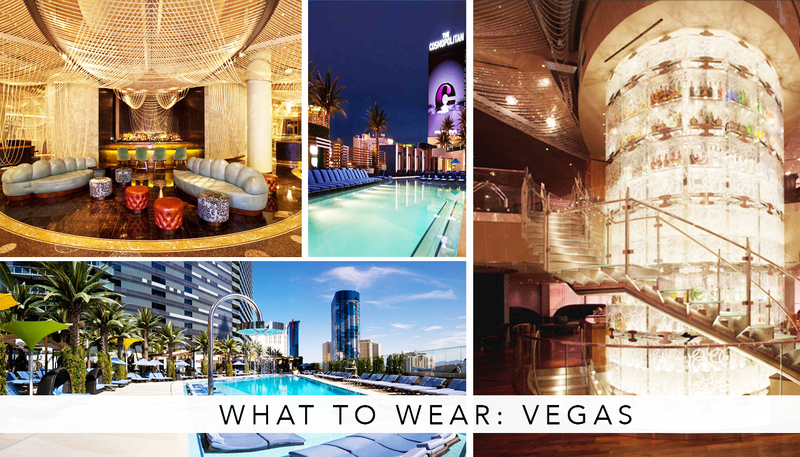 Seeing all the gorgeous hotels, I was inspired by VEGAS.COM to create a ‘What To Wear in Vegas’ outfit post. Now, I’ve never been to Vegas but being an architecture student and enthusiast who loves fashion, I was super excited to look up the hotels and attractions through VEGAS.COM and use them as inspiration for outfits. I spent hours looking through this site to find a fab Las Vegas hotel and it was not easy choosing JUST one resort (they all looked incredible!). But in the end, I chose to go with the resort, THE COSMOPOLITAN OF VEGAS. The resort boasts sophistication and elegance with golds and silvers, large chandeliers and reflective surfaces. For every picture I looked at for this hotel, there was a unique atmosphere that they all promoted. Upon entry to the hotel, you are greeted with luxurious golds and a sophisticated environment. The moment you step outside, you’re breath taken by the gorgeous blue pool where the water reflects elegantly in the sun, which cleverly also reflects the interior of the hotel rooms! I feel from the moment you step inside to the moment you step outside, there’s an incredible journey and a unique experience every step of the way. For this post, I was inspired by the golds, reflective materials, gorgeous blue pools and the classy and sophisticated environment. The cosmopolitan is surrounded by lush greenery and beautiful turquoise pools. So, with three incredible pools, you’ll most likely be tempted to lounge by the pool all day. So, here’s a flat lay of my ideal pool outfit in Vegas. These swimmers from ASOS have been my favourite this summer so far! I love the colours of the swimmers and how bright and fun they are. They reflect the furniture inside the hotel where the furniture contrasts to the atmosphere in a unique way. And that’s exactly what I wanted to achieve – a fun unique outfit for the beautiful blue and lush green surrounding. Paired with white nail polish and some earrings / rings (if you’re not planning on swimming! ), you can still look super classy and ready for vegas while lounging by the pool! After all that lounging, you’ll most likely want to go out and party all night. Or, before that, you may want to go exploring Vegas! So, here’s what I would wear during the day. This can even be transformed into a going out outfit simply by accessorising! This means saving time which means more time to party! This outfit was inspired by the resort THE COSMOPOLITAN OF LAS VEGAS. The night transition for this outfit was chosen for dinner at the LAGO, next to the BELLAGIO FOUNTAINS (super classy restaurant!) OR to go out to HYDE BELLAGIO CLUB. The gorgeous black playsuit with greens, pinks and whites is from DOLLYGIRL FASHION (my fave online shopping website atm!). A playsuit is perfect for going out because not only will it be super comfy but it can look classy and dressed up with the right jewellery. The playsuit can also be worn during the day with simple jewellery and transformed into a classy night outfit with the help of jewellery, makeup and shoes! The dress is quite shiny, but not too much or not too little, just the perfect amount! And because of this, the playsuit reflects the gorgeous golds and silvers within the resort. And for shoes, these beige booties have been my favourite! They go with black so well and they’re super comfy! For the night out accessories, I thought it would be great to keep it simple with some classic big silver hoops and some rings. As for the makeup, I would go DARK DARK DARK! Beautiful plums to reflect the whole mood and atmosphere of this sophisticated resort. It’ll also reflect off the gorgeous lighting throughout the resort and surroundings. And there we have it, my #UltimateVegasOutfit. If you’re planning on going to Las Vegas, please do check out the incredible Vegas site HERE for information on anything and everything you’ll ever need for the trip! Let me know what you guys think and what your ultimate outfit would be! Pom Poms Fashion Trend – Yay or Nay? Previous Post Monthly Recap | PINTEREST & INSTAGRAM FAVES! Next Post Christmas Gift Guide for HER!